"Hate Speech and Legislation in Austria and the European Union" by Wolfgang Brandstetter Dr.
Dr. Wolfgang Brandstetter, Federal Minister of Justice of the Republic of Austria, offered an overview of European law and attitudes regarding the limits of free speech in the wake of attack on the French satirical magazine Charlie Hebdo that killed a dozen people in Paris. His Feb. 3 remarks explained how member states of the European Union (EU) are bound by the conventions of its Court of Human Rights. In 2008, the Court laid out the framework for speech that is punishable by a prison term. Broadly speaking, the criteria includes demonstrated xenophobia, or speech that disparages or intimidates along the lines of race, gender, ethnicity, sexual orientation, language, or color. 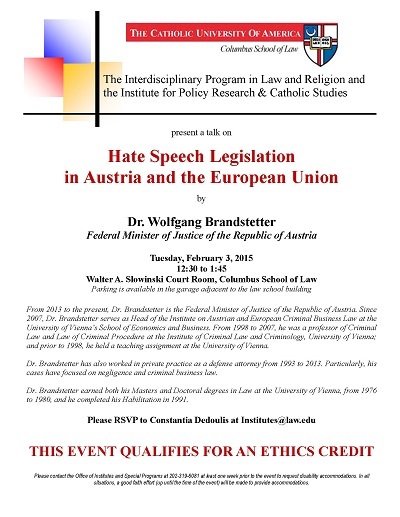 Brandstetter, Wolfgang Dr., "Hate Speech and Legislation in Austria and the European Union" (2015). Other Lectures & Events. 5.